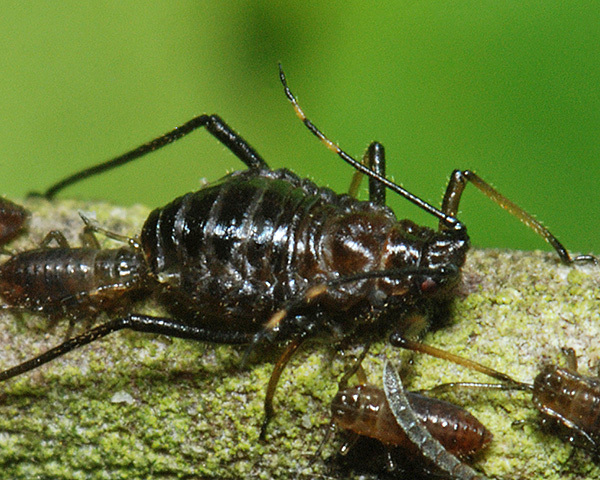 Symydobius are medium to large, rather shiny dark brown aphids. Both winged and wingless adult viviparous females occur and (unusually) they have a similar pattern of sclerotization. Siphunculi (when present) are small and truncate. Their antennae are dark, or have the basal half of the 4th and 5th segments conspicuously paler. Males are wingless, and oviparae have the posterior abdominal segments extended into an ovipositor-like structure. The Symydobius genus has seven species, which form colonies on the branches and twigs of birch and alder (Betulaceae). They have a sexual stage in their life cycle, but do not host alternate. They are always attended by ants. Apterae of Symydobius oblongus (see first picture below) are shiny dark brown with no wax covering. The antennae are brown apart from the basal parts of segments 4-6 which are conspicuously pale. They are slightly shorter than the length of the body with a terminal process that is shorter than the base of the last antennal segment. The dorsal abdominal pattern comprises a broad dark transverse bands and marginal sclerites on each tergite. The siphunculi are pale, short and truncate. The body length of apterae is 2.0-3.5 mm. Alates of Symydobius oblongus (see second picture below) have brownish bordered wing veins and a similar dorsal abdominal pattern of sclerotization to the aptera. Oviparae have the dorsal sclerotic pattern reduced on segments behind the siphunculi. The males are apterous and like the viviparae, but smaller and more slender. Symydobius oblongus nymphs do not have the dorsal pigmented bands, except across tergite 8. The shiny birch aphid is found on twigs, young stems and branches of both the silver birch (Betula pendula) and the downy birch (Betula pubescens). It is found both in birch woodland and on heaths with birch scrub. 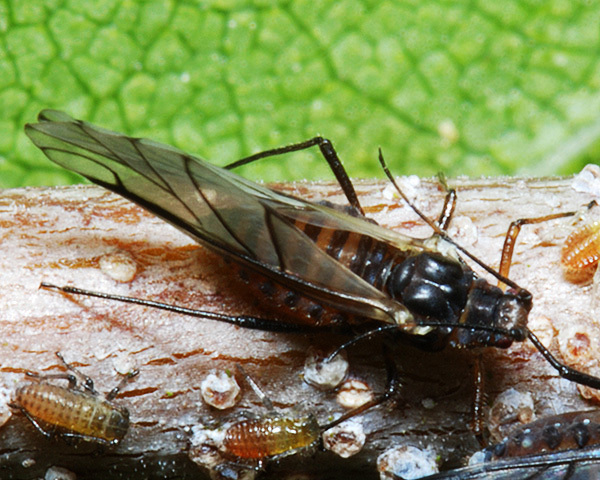 Sexual forms (oviparae and wingless males) occur in October-November. Symydobius oblongus is found throughout Europe and across Asia.